Figure 1. Medusahead and barb goatgrass with other commonly co-occurring annual grasses. 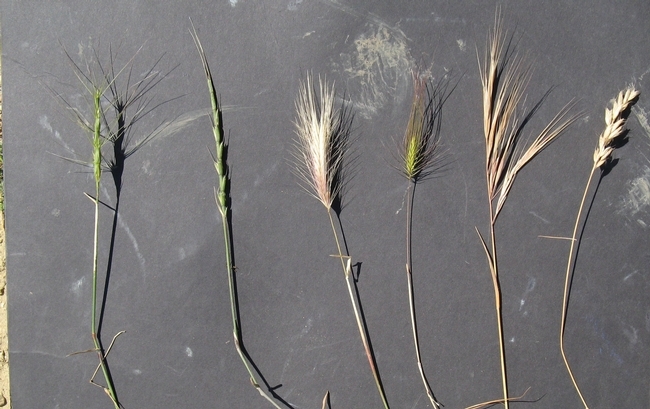 Left to right: Barb goatgrass, jointed goatgrass, hare barley, medusahead, ripgut brome, soft brome. Photo: J. Davy. 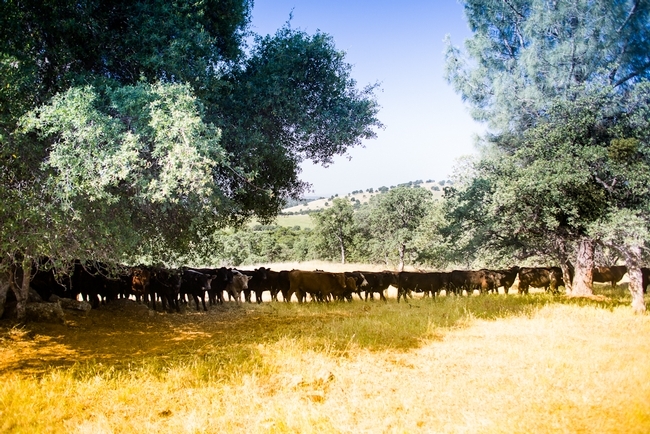 Medusahead and barb goatgrass are two harmful invasive annual grasses in California that have caused problems for ranchers and land managers since their introduction. 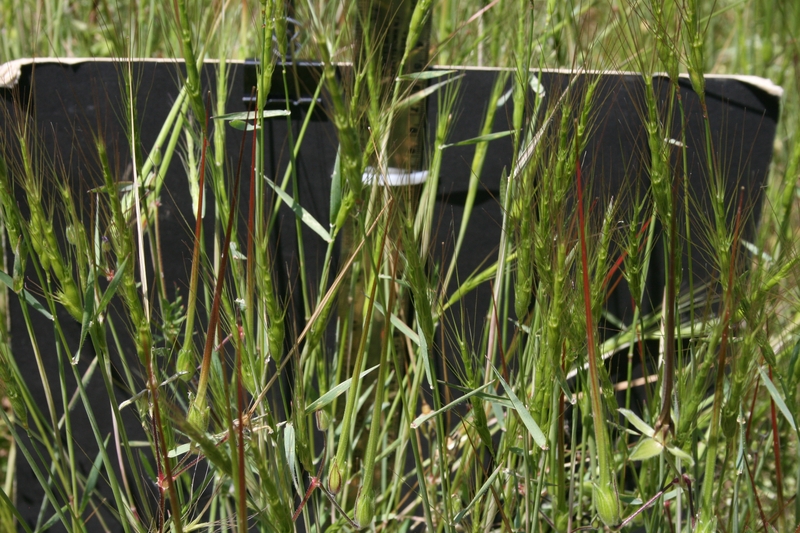 UC researchers have made significant advances in developing and understanding techniques to manage these noxious weeds (see overview of key research areas here) but many management practices are costly or logistically difficult to deploy. Of the potential management tools, grazing and mowing may be the most cost effective and practical ways to control these species but the outcome of these practices can vary depending on when in the growing season these practices are deployed. Over the last few years a team of UC researchers have explored the potential of using plant phenology to identify when targeted grazing or mowing can be applied to have the largest negative impact on medusahead and barb goatgrass. Phenology refers to the timing of biological events throughout the year and how they relate to climate and landscape. Medusahead and barb goatgrass are mostly typical of other annual grasses in California (Figure 1) in that they germinate after the start of the fall rains, grow through the winter (Figure 2), and then produce reproductive parts, flowers and seeds, in the spring. This research shows that if grazing or mowing are applied before the stem begins to elongate, the effect of these control treatments on seed production is minimal. Applying grazing or mowing treatments after the stem elongates but before the seed head emerges can decrease seed production by more than ten-fold. Figure 3. 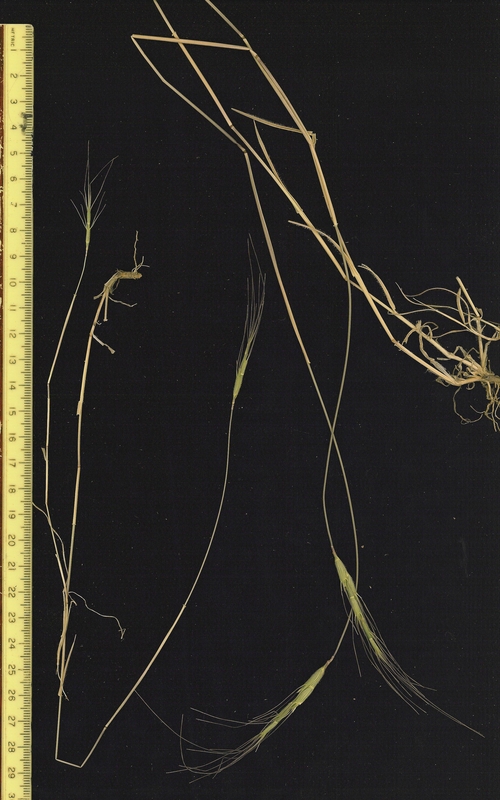 Medusahead (3a) and barb goatgrass (3b) showing inflorescences with long, stiff awns in the stages when nutritional content drops, making attempts at targeted grazing ineffective due to livestock aversion, but mowing remains effective. Photos: E. Laca. Parts associated with the flower and seed head play a big role in why these noxious weeds are undesirable. Both of these grasses produce long, stiff awns that make them unpalatable to livestock (and produce discomfort to people and pets when they become stuck in our clothes). In addition, analysis shows that the nutritional content of these grasses falls below adequate levels as forage for cattle and sheep as they begin to produce flowers and awns (Figure 3). Once seed heads develop mowing or grazing will not prevent the seeds from becoming viable and germinating (Figure 4). These observations on how the traits of medusahead and barb goatgrass change through the growing season have allowed us to define limits for when targeted grazing and mowing should begin and end. Once medusahead and barb goatgrass become susceptible to defoliation in the spring, there is a 2 to 3 week window during which targeted grazing can be used to treat medusahead (at stocking rates of 1 to 3 Animal Unit Month, or AUMs per acre, depending on the initial standing crop of forage) followed by a 5 week window during which mowing can be effective to treat either medusahead or barb goatgrass. 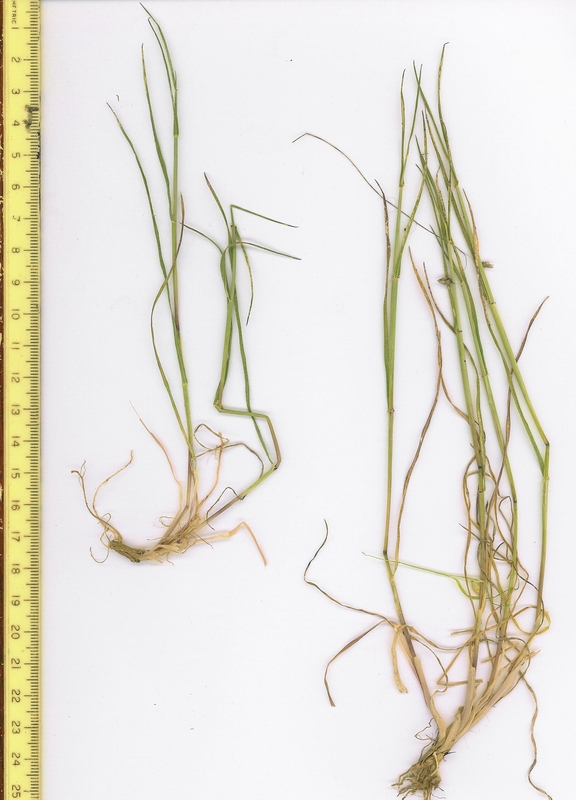 More information on treating these two noxious weeds will soon be available in the UC ANR publication 8567, “Barb Goatgrass and Medusahead: Timing of Grazing and Mowing Treatments” that will be available on the SFREC website and through the ANR Catalog site. As many know all too well, invasive plants are one of the greatest threats to rangelands due to competition with native species, reduced forage quality for livestock and wildlife, and multiple other ecological factors. 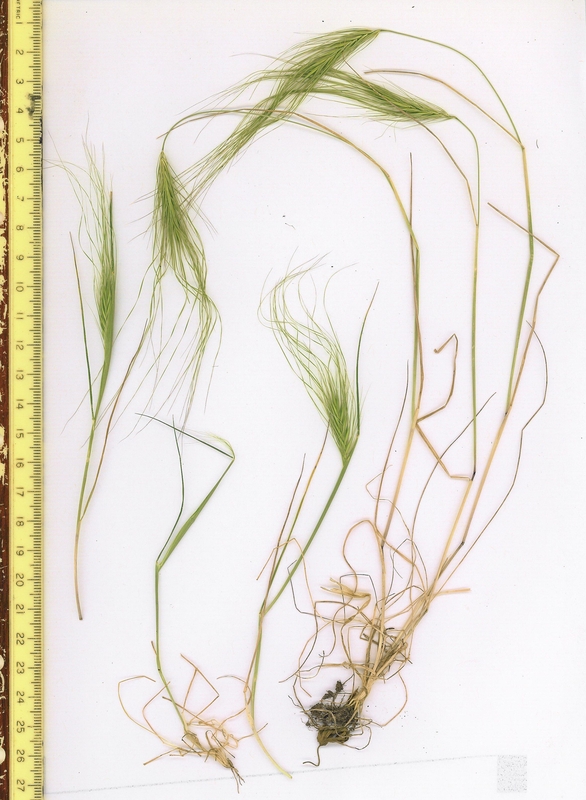 One particular invasive grass known as medusahead (Taeniatherum caput-medusae) is extremely widespread in rangelands across the western states. As an aggressive winter annual that can quickly infest ranches, medusahead has been the focus of numerous research projects. Ecologist and researcher Erica Spotswood of the Katharine Suding Lab at the University of California, Berkeley, has an ongoing project involving medusahead dispersal vectors, climatic conditions enhancing species spread, and the impacts of livestock grazing on medusahead populations. While data is still being collected and analyzed, Spotswood shared some observations from the research conducted thus far. “We do not yet know the effects of grazing, but results from our first year of data indicate that medusahead does well in places with higher soil moisture, and with more grass cover. We also know from some experiments that cows can definitely move seeds around. The seeds attach to their fur, but don't stay on very long, and they probably drop most of them within the first 20 feet of picking them up,” said Spotswood. The winter annual grass Taeniatherum caput-medusae (L.) Nevski, commonly known as medusahead, is one of the most dominant invasive range species in the West. Despite a broad understanding of medusahead impacts we have limited understanding of how environmental conditions and management strategies influence medusahead population dynamics. This insight is key if we are to ultimately forecast changes in medusahead abundance and spread under various conditions. Using periodic matrix models, we are investigating how density and habitat type (grassland vs. oak woodland) and defoliation influence population dynamics. First year results show strong density dependence ranging from positive to negative depending on time of year with oak woodland habitat suppressing medusahead population growth much more than open grassland. At the end of May trained SFREC staff along with members of Cal Fire conducted a prescribed burn to manage vegetation on the center. There are many advantages to conducting a burn rather than other management practices. These advantages include the ability to kill off weed-seed violations and remove any unwanted species that threaten the native species in an ecosystem. However, with the current air-quality regulations and state of drought, a prescribed burn can be difficult to get approved this time of year. SFREC had a burn scheduled last week that was postponed to a later date because of these difficulties. The burned area will be used to look at the utility of spring burns to manage vegetation and eliminate invasive species such as medusa head and star thistle as well as look at the success rate of the native species after the invasion and burn. 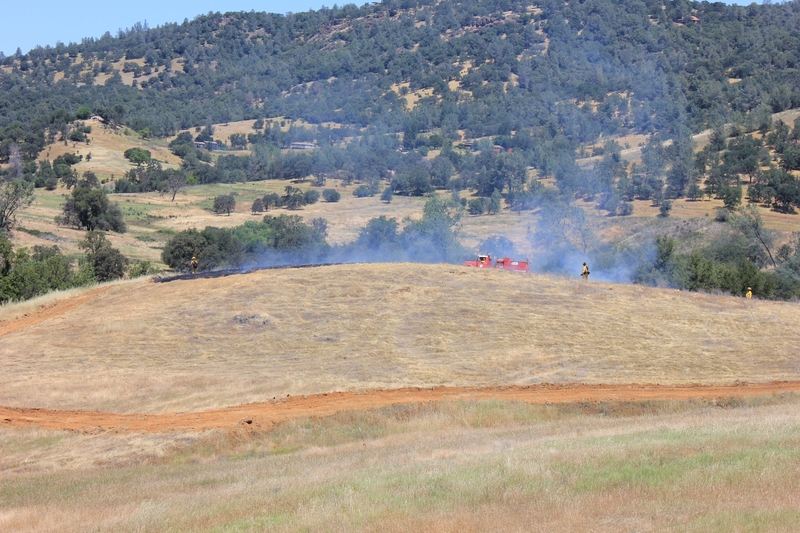 We thank the members of Cal Fire for working with our staff to conduct a safe and successful burn. SFREC medusahead barb goatgrass forum is a success! Folks travelled across the state and beyond to discuss and learn about management for medusahead and barb goatgrass. 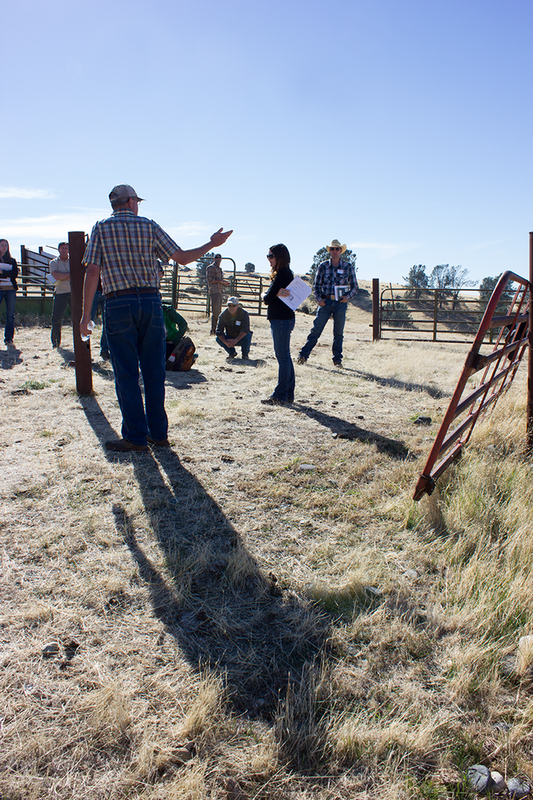 On November 5th SFREC held a day-long forum on two of the most serious rangeland weeds confronting the California rangeland community. Over 110 people from a diverse background, experience and interests in these weeds attended this event. For many, it was the first time visiting SFREC and even the first time experiencing what the UC Research and Extension Center had to offer. Some attendees travelled more than 6 hours to get to the Center. Ken Tate talks about these invasive grasses on the field tour. 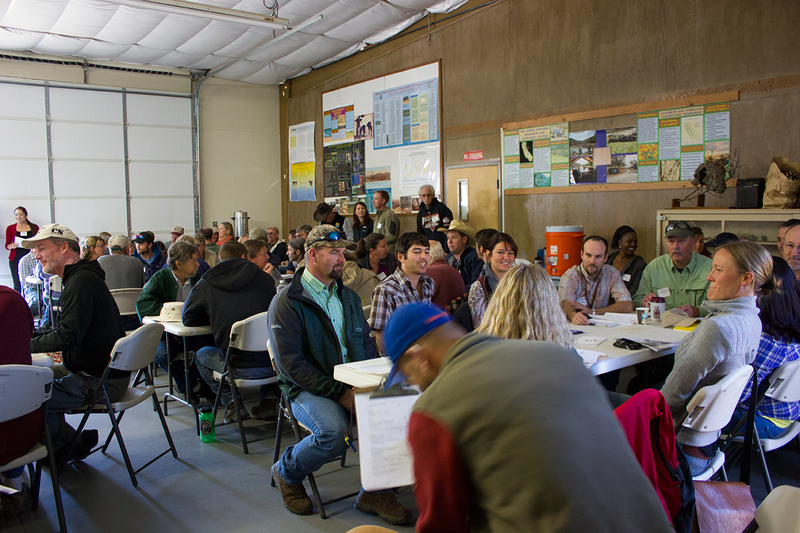 The forum organized over 20 UC academics, graduate students and cooperators researching medusahead and barb goatgrass management across the state. Given the broad knowledge base and the complex nature of these invasions, SFREC used a “lightening presentation” approach. Each speaker was given 5 minutes to outline their core research findings. This format encouraged presenters and attendees to get to the nuts and bolts of the issues on hand and provide a large amount of time for discussion among attendees. Each presenter put together a one-page handout that summarized their main points. This handout can be accessed (here) and a webcast of the day's event will be uploaded (here). Please contact the SFREC Director Jeremy James if you want additional information about the day.